Let’s take a look at how using Complex Bio-Carb in concert with MycoGold® Bio-Inoculants provides an input strategy second to none. Some of our first time customers start out using the MycoGold® Bio-Inoculant seed treatment along with their soil appropriate fertilizer program. While this is an effective and successful "stand alone" input strategy, we have experienced all positive results using an additional carbon source along with MycoGold®. Over the past couple of years, ourselves and a group of MycoGold® customers have been testing MycoGold® Inoculants along with various additional carbon source inputs. Excellent results were obtained by our customers and us using various carbon sources such as sugar and other carbon rich products that are soluble. Testing included applications both in furrow and as a foliar. 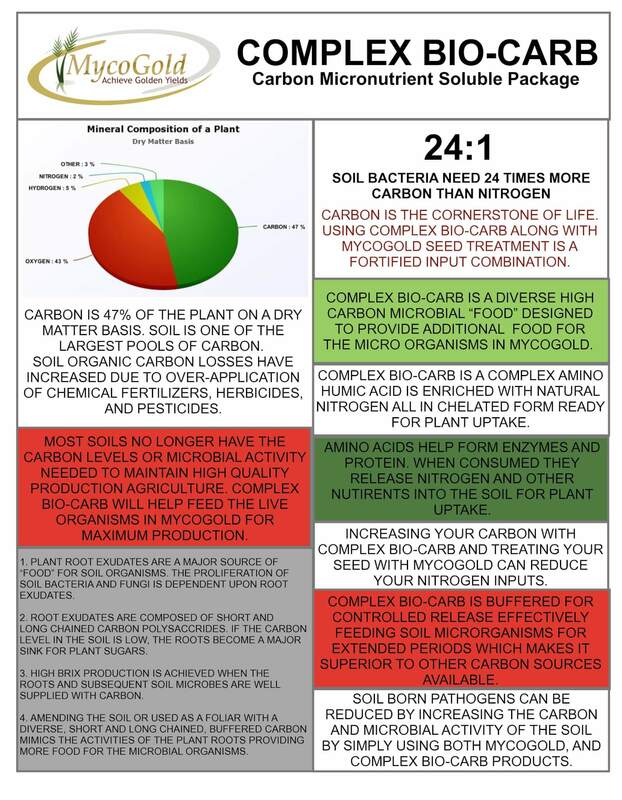 Carbon provides an additional food source for the microbial organisms contained within MycoGold®. Think of it this way. The bio stimulant package in all MycoGold® Bio-Inoculant product blends are an adequate three course meal for the live organisms. Adding an additional carbon source is like offering a twelve course meal for the critters resulting in better plant growth at the most crucial growth cycles which increases production. There are multiple carbon source conditioner products available. Considering all the different carbon source products tested, we recommend using Complex Bio-Carb for its low cost, chelated form, extended release properties, performance, and overall efficacy. Complex Bio-Carb is available exclusively through MycoGold® and may be applied in furrow with or without fertilizer. It can also be applied as foliar along with pesticide. Adding carbon to the soil is critical to restoring health to the soil by increasing the organic matter content. Producers in today’s modern agricultural systems are working with soils that contain far less carbon than our soils originally contained prior to the implementation of modern agriculture. All of our soils are now degraded. The good news is we now know how we can regenerate our soils and put the carbon back in the soil.So why is carbon so important? It’s the building block for soil health. As you increase the carbon content, you begin to improve the aggregate stability. These aggregates are formed by excretions from the soil microbes, which begin to stabilize the soil particles into larger aggregates. This provides the home for all the soil microbes living in these aggregates. The carbon, nutrient, and water cycles in a healthy soil are all interrelated. In order for these cycles to perform to the best of their abilities, the soil must contain all of the necessary ingredients. If the soil is lacking carbon, the nutrient and water cycles are unable to perform to their highest abilities. How is Complex Bio-Carb applied?